With a new data storage tier created by Intel® Optane™ technology, data centers can consistently realize amazing response times under any workload. With NAND-based SSDs, random write operations require an immense amount of background media management. These tasks can add significant delay to the read operations. 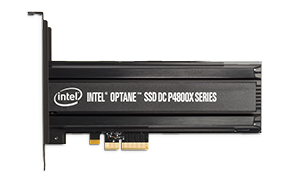 The Intel® Optane™ SSD DC P4800X maintains consistent read response times regardless of the write throughput applied to the drive. Read response times remain below <30μs while withstanding up to 2GB/s of random write pressure. 1 Responsiveness defined as average read latency measured at queue depth 1 during 4k random write workload. Measured using FIO 2.15. Common configuration - Intel® 2U Server System, OS CentOS* 7.2, kernel 3.10.0-327.el7.x86_64, CPU 2 x Intel® Xeon® E5-2699 v4 @ 2.20GHz (22 cores), RAM 396 GB DDR @ 2133MHz. Intel drives evaluated - Intel® Optane™ SSD DC P4800X 375GB and Intel® SSD DC P3700 1600 GB. Samsung drives evaluated – Samsung SSD* PM1725a, Samsung SSD* PM1725, Samsung* PM963, Samsung* PM953. Micron drive evaluated – Micron* 9100 PCIe* NVMe* SSD. Toshiba drives evaluated – Toshiba* ZD6300. Test – QD1 Random Read 4K latency, QD1 Random RW 4K 70% Read latency, QD1 Random Write 4K latency using FIO 2.15. 2 Common Configuration - Intel® 2U Server System, OS CentOS* 7.2, kernel 3.10.0-327.el7.x86_64, CPU 2 x Intel® Xeon® E5-2699 v4 @ 2.20GHz (22 cores), RAM 396GB DDR @ 2133MHz. Configuration – Intel® Optane™ SSD DC P4800X 375GB and Intel® SSD DC P3700 1600 GB. Performance – measured under 4K 70-30 workload at QD1-16 using FIO 2.15. 3 Common Configuration - Intel® 2U Server System, OS CentOS* 7.2, kernel 3.10.0-327.el7.x86_64, CPU 2 x Intel® Xeon® E5-2699 v4 @ 2.20GHz (22 cores), RAM 396GB DDR @ 2133MHz. Configuration – Intel® Optane™ SSD DC P4800X 375GB and Intel® SSD DC P3700 1600 GB. Latency – Average read latency measured at QD1 during 4K Random Write operations using FIO 2.15. 4 Common Configuration - Intel® 2U Server System, OS CentOS* 7.2, kernel 3.10.0-327.el7.x86_64, CPU 2 x Intel® Xeon® E5-2699 v4 @ 2.20GHz (22 cores), RAM 396GB DDR @ 2133MHz. Configuration – Intel® Optane™ SSD DC P4800X 375GB and Intel® SSD DC P3700 1600 GB. QoS – measures 99% QoS under 4K 70-30 workload at QD1 using FIO 2.15. 5 4KB = 4,096 bytes. 6 Performance measured using FIO* rev 2.13, with 4 workers with total queue depth of 16. Why choosing for Intel® Optane™ Technology?  The extended memory use case allows an Intel® Optane™ SSD to participate in a shared memory pool with DRAM at either the OS or application level enabling bigger memory or more affordable memory. Bigger memory dramatically increases the size of ‘working sets’ to enable new insights from data in growing segments such as scientific computing, healthcare and autonomous driving. 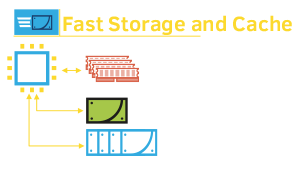 More affordable memory means data centers can use Intel® Optane™ SSDs to displace some DRAM.